Minnesota Valley Action Council offers a Head Start Program for preschool children ages 3 to 5 in our nine-county service area which includes the counties of Blue Earth, Brown, Le Sueur, Martin, Nicollet, Sibley, Waseca, and Watonwan. Click here for locations. Home-Based parents and children have a weekly 1½ hour home visit. Parents and children also meet for a school time experience at a Head Start site a couple of times each month. Center-Based children meet at a Head Start site for a 3½ hour center day four days a week. Combination parents and children have a 1½ hour home visit two times a month. Children meet for a 3½ hour center day two days a week. Our 0-3 Head Start Program serves pregnant women and children birth to 3 in a Home-Based option. The 0-3 program is available in the counties of Blue Earth, Le Sueur, Nicollet, Waseca, and Watonwan. In our 0-3 program, the Home Visitor will conduct a weekly home visit, while supporting you through your pregnancy and the early years of your baby’s life. The program will help you strengthen parent/child interactions; provide experiences to boost your child’s growth and development; create a learning environment; evaluate your child’s health, mental health, and developmental progress; gain community support for nutrition, health, employment, housing, and educational programs; make your home safer for your child; and gain information on how to care for and support your child. “School Day” is a learning and interaction time for you and your child and a positive environment to help your child develop social and play skills. Parent education and interaction is also provided. Please call the Birth to Three office in your area to apply. With our services to pregnant women, you will meet with a Home Visitor and Health Consultant to discuss topics such as pregnancy and childbirth education, nutrition for pregnant women and newborns, fetal growth and development, how to care for your newborn, benefits of breastfeeding, and postpartum recovery and depression. The Home Visitor will also assist you with finding a doctor and scheduling appointments for prenatal care. Support for gaining access to community resources, such as WIC, will also be provided. Please call the Pregnant Women office in your area to apply. Every part of how the program works is planned. Programs are designed to meet the community’s needs and the regulations. A solid design and strong, thoughtful management help a program reach its goals. With a solid foundation, the program manages its finances, supports the staff, and improves the lives of children and families. All parents who have children enrolled in the program are members of their Parent Committee. The meetings happen 5 times during the school year in September, November, January, March, and April. 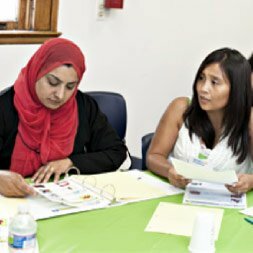 Parent Committees work together with the staff in planning activities for the children. Parenting related topics and Policy Council Meeting minutes and information are discussed at Parent Committee Meetings. Policy Council reviews policies, advises and makes recommendations to the MVAC Board of Directors. Each Parent Committee elects a representative and an alternate from their classroom to serve on this council. Representatives from each classroom keep information flowing back and forth between Parent Committees and the Policy Council. Policy Council meetings are held once a month at the Administration office in Mankato.